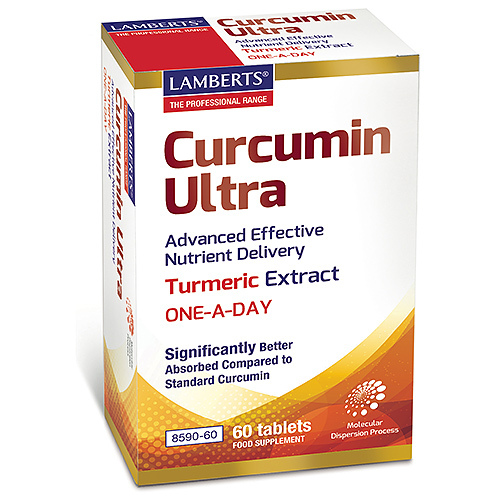 The Curcumin Ultra is a food supplement providing a specially prepared extract of Turmeric (Curcuma longa L.). One established problem with curcumin is that it does not easily dissolve in water and it is this feature of the compound that is believed to significantly limit the amount that can be absorbed from our digestive systems. For this reason, LAMBERTS have carefully selected a turmeric extract with ‘enhanced absorption’. Curcumin Ultra contains CurcuWIN® which is manufactured utilising proprietary UltraSOL­ technology. This is a molecular dispersion process that enhances the bioavailability of poorly absorbed nutrients and increases water dispersibility of fat soluble ingredients such as curcumin. Bulking Agents: DiCalcium Phosphate, TriCalcium Phosphate and Povidone, Crosslinked Cellulose Gum, Antioxidant: Mixed Tocopherols, Anti-caking Agents: Magnesium Stearate & Silicon Dioxide, Glazing Agents: Hydroxypropyl Methylcellulose & Hydroxypropyl Cellulose, Colours: Titanium Dioxide & Riboflavin, Polypropylene Glycol. Take 1 tablet daily, or as directed by a practitioner or pharmacist. Swallow whole with water. Below are reviews of LAMBERTS Curcumin Ultra - Turmeric Extract - 60 Tablets by bodykind customers. If you have tried this product we'd love to hear what you think so please leave a review. Excellent product, great company to do business.